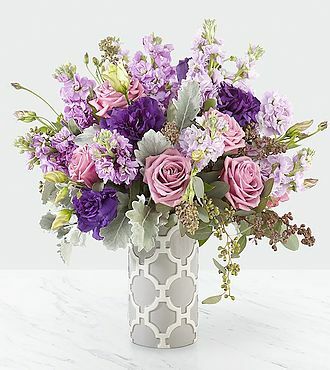 Nothing says regal like a gorgeous array of violet hues surrounded by luscious greens. Lavender roses and deep lisianthus stems set with eucalyptus stems instantly draws in all the attention of the room. This handcrafted design in a gray and ivory ceramic vase is sure to add hints of grace and beauty for a polished look. This impressive bouquet is approximately 19H x 18W. You save over $6 at FlowersFast! (Compare to FTD retail price: $125 + $22.98 for same-day delivery.) You get the same quality, at a lower price! No extra charge for same-day delivery. FREE personalized gift message included. (Extra delivery charge for Alaska and Hawaii) Same-day florist delivery is available for this item, for orders placed before Noon in the recipient's timezone. Please see the Ordering and Delivery Information.